The Princess Caroline is the most romantic venue for your wedding. You will feel special & different from all the rest. Imagine the stunning photos taken with the flag blowing gently , the sailing boats in the background in contrast with the warm glow of the sunset. You will eat like Kings & Queens on the lower deck for up to 110 guests – the menu of your choice – individual menus created by request with highly trained serving staff to look after all of your guests. Then dance the night away on the top deck with a quiet breeze to keep you cool whilst looking at the stars ( you can enjoy the versatility of open canopies & roof or closed in a moment with full heating or air conditioning ). Neither you nor your guests will ever forget your special day. We are children friendly and offer packages starting from approximately – £55.00 + vat per guest. This is based on a minimum of 90 adults for the evening reception. This suits many couples as they can prefer to have more intimate numbers for the wedding breakfast with close family & friends & then it’s party time later on! Also if you’re flexible with dates this can also affect pricing & mean that we can offer great discounts too. 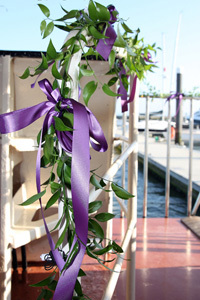 Please read our guide to planning your wedding on board the Princess Caroline here. Our home berth is in Town Quay, Southampton, Hampshire.